It’s time to put away the scuba dresses, black and white striped pieces and anything neon. Fall fashion has arrived along with a new set of trends. For this season the theme is a play on feminine and masculine styles with a bit of androgynous punk thrown in. For their fall show, Versace’s usual glamour was mixed with punk details. Fall and winter shows coincided with the anticipation of Metropolitan Museum’s fashion exhibit, Punk: Chaos to Couture, held at the Costume Institute earlier this year. These events culminated in the alternative trend currently found in stores and as a part of street style. For fall, Rodarte showcased their punk sensibility with deconstructed dresses and oversized motorcycle jackets. Hardware details, vinyl pants and tangled layers of necklaces were spotted over at Versace. Even Chanel designed thigh-high leather boots draped with metal chains. To get the punk look, try pairing a distressed leather jacket with skinny tartan pants and combat boots. Incorporate details such as studs, chains and spikes. An additional and easy way to add a touch of punk to your ensemble is with an ear cuff. Seen at Jean Paul Gaultier and Thakoon, the ear cuff is definitely undergoing a revival. 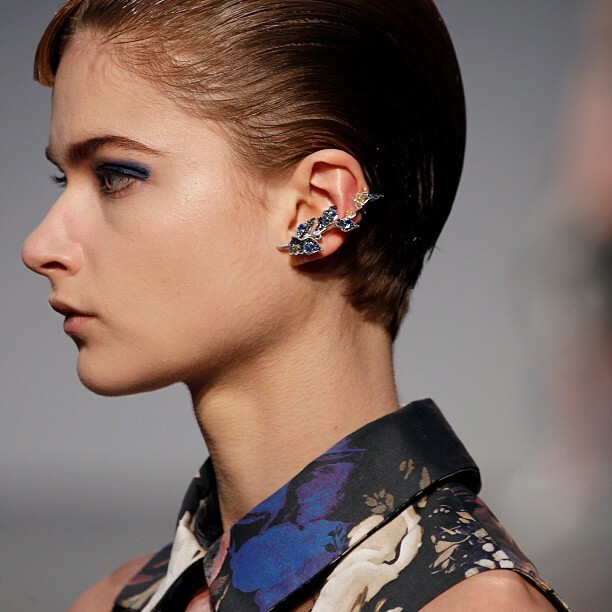 Jewelled ear cuffs sparkled down the runway at Thakoon. Another returning 90s fashion trend is grunge, mostly due to the collection at Saint Laurent. For a grunge style, the key is to look like your outfit was assembled from thrift store finds. Flannel shirts, oversized sweaters, babydoll dresses, patterned tights, and jean jackets and vests were the essence of this subculture’s fashion. 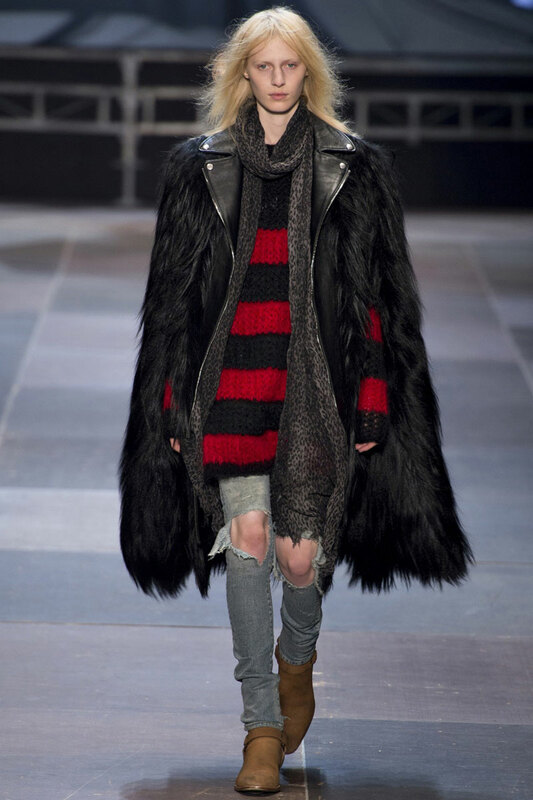 Grunge at Saint Laurent’s fall 2013 show. For silhouettes, both menswear-inspired and feminine 1940s shapes are on trend. The two were perfectly encapsulated in Dries Van Noten’s show. Slouchy, oversized contours were mixed with feathered textures and brocade pieces. The 1940s style was seen at in at a multitude of shows, such as Prada, Rochas and Lanvin. Characterized by nipped-in waists and full skirts, the refined ladylike look would fit right into Hitchcock’s film noirs. For menswear, the idea is to look like you borrowed a coat or blazer from your boyfriend’s wardrobe. Try oversized single- or double-breasted topcoats. For a more figure flattering approach, buckle a belt over the waist of the coat. Menswear-inspired style was spotted at Stella McCartney, 3.1 Phillip Lim and Chloe. A dress at Lanvin that combines both the 1940s and pink trends. Another way to try out the menswear trend is through fabrics. Pinstripes, herringbone, houndstooth, tweed, argyle and Glen plaid are easy to incorporate into a fall wardrobe. Ease into it by adding a patterned piece to an otherwise neutral ensemble. For the bold, try wearing head to toe patterns. The key is to anchor the look by picking pieces from the same colour family. A menswear-inspired look at 3.1 Phillip Lim. Always popular for fall and winter is fur. Whether real or faux, fur pieces were all over the runways from accessories to dresses. Fendi even incorporated the texture into the models’ hair for a furry mohawk. A range of fur were seen at the fall shows, from colourful dyed fur seen at Lanvin and Versace, to classic fur stoles shown at Marc Jacobs. For colours, both warm and cool tones ran rampant in the fall collections. Reds and pinks were popular for warmer hues while blues and greys ruled the cool shades. Even Valentino strayed from his signature red, aside from a few pieces, and focused on blue dresses. Over at Dolce & Gabbana, red gowns made a dramatic finale at their show. Cotton candy pink dresses and coats were refreshing amidst the dark ensembles at Simone Rocha. If you want to splurge on a trendy item for the fall, make it an oversized yet structured coat in a tone of red or blue. It’ll be perfect for layering over a chunky sweater. Pink, a refreshing colour trend for fall, was the highlight of the Simone Rocha show. Fall accessories also follow the masculine and feminine trend. Menswear-inspired flats such as oxford shoes and loafers are popular this season. For a girlier touch, there’s ankle-strap heels, stacked pumps and over-the-knee boots. As for bags anything goes in terms of size, from small clutches to big portfolio bags and slouchy purses. Whether your usual style leans more towards ladylike, menswear-inspired or punk, there’s a fall trend that will complement and update your existing wardrobe. So layer up and have fun with fashion!